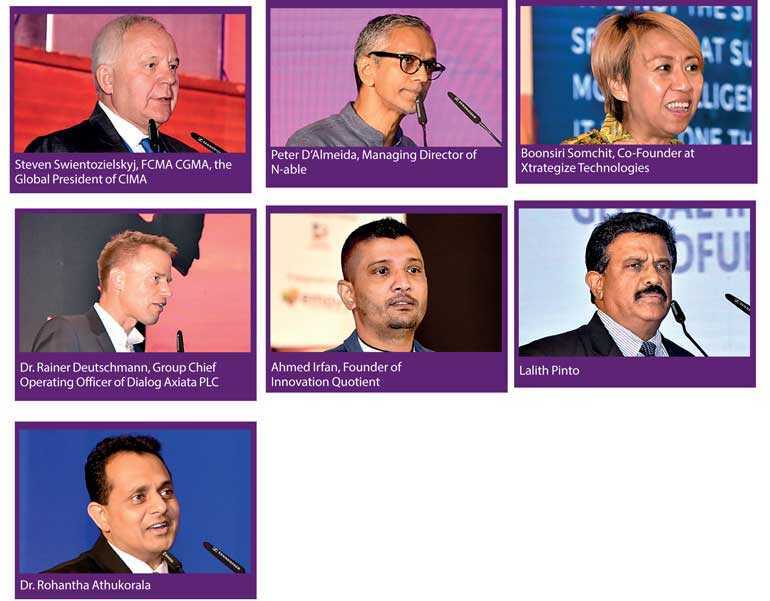 Several business leaders and professionals shared key insights on leadership, disruption of business models and unlocking opportunities for Sri Lanka at the CIMA Business Leaders’ Summit 2018, which was held on 28 and 29 August at the Shangri-La Hotel, Colombo. The opening remarks at the technical sessions were made by Venkkat Ramanan, FCMA CGMA, Regional Vice President, Asia Pacific, CIMA. He added that all organisations were global and were changing in unpredictable ways. The environment is volatile and at times in chaos. The five key drivers of change showcased were globalisation, geo political events, consumer empowerment, demographic changes and technology. He spoke of challenges in managing teams who are diverse, i.e. from baby boomers, generation X, generation Z and so on. Technology is transforming the industry with artificial intelligence, big data and analytics, internet of things, social media platforms, etc. At present, we are in a rational position as far as the finance profession is considered. However, we are headed towards a chaotic situation where the current skill set is most certainly out of date. He also showcased the role of finance in the new world and how to do they create and preserve value. In concluding the Global President mentioned that the future would have humans and machines working together to deliver value to businesses. This was followed by a presentation by Dr. Rainer Deutschmann, Group Chief Operating Officer of Dialog Axiata PLC, on ‘Global Trends in Transforming Business – the Big Impact’. He focused on the global trends and spoke of how successful companies thrive in the dynamic environment. Dr. Deutschmann stated that the most prevalent trends are on connectivity and that more than half of the population of the world is connected through internet. He referred to global research statistics to depict the trends in connectivity, machine learning, AI, AR, block chain, etc. In the panel discussion that followed these presentations, Tony Weerasinghe, founder of Ustocktrade LLC, explained the importance of adopting block-chain technology in the banking sector that would considerably ease the activity of validation and greatly reduce transaction costs. In reply, Central Bank Governor Dr. Indrajit Coomaraswamy stated that it was important to proceed with digitalisation without destabilising the banking sector, and that this was one of the main concerns of the Central Bank in introducing block-chain technology for banks. He said that two committees that had been appointed to study the matter had completed the study and that the process would be carried out gradually. He said that the Central Bank was keen to ensure macroeconomic stability and to have a regime of flexible inflation targeting as a policy measure. In this context, technology would be gradually introduced to cause minimum market disruption to have price and financial market stability. The Governor added that the Central Bank was very conscious that EKYC would reduce transaction costs but was concerned of anti-money laundering provisions that have to be complied with. Despite these constraints, EKYC would be given high priority, and the government was making the initiative on matters concerning biometrics in order to bring block-chain technology to several sectors of the economy, Dr. Coomaraswamy added. Dr. Deutschmann said that once the main stage of block-chain is used it has many benefits, but authentication causes difficulty before reaching that stage. Thereafter, biometrics would need to be examined. India, he said, has made considerable progress in addressing issues concerning block-chain technology. The entire legal system would need to support the technology. Dr. Rainer added that data ownership and privacy issues would need significant attention. Reyaz Mihular, FCMA CGMA, Managing Partner of KPMG in Sri Lanka, said that accountants need to move away from giving an opinion on a set of financial statements as at a certain date, and instead should consider giving an opinion after auditing the processes of a business. In the modern context, it was important that businesses are continuously monitored and historic data analysis would not suffice. On crypto currencies, Dr. Coomaraswamy reiterated the Central Bank’s position that such currencies were not authorised to be issued to the market in order to ensure price and economic stability and financial market stability. In responding to a question from Weerakkody on the Central Bank’s role in embracing technologies, Dr. Coomaraswamy stated that the banking sector was digitalised and the financial services sector was the lifeline of the economy. He added that the Central Bank was constantly looking at ways and means of reducing the transaction costs for financial intermediation. Peter D’Almeida, Managing Director of N-able, provided the foundation for the panel discussion through his speech on ‘Disruptive Business Models in Sri Lanka’. D’Almeida emphasised on the importance of creative accounting by stating that whenever there is a problem we always turn to the 500-year-old tool Balance Sheet and Profit and Loss Account. The general matrix used to measure success is Return On Investment, Return On Asset and IRR. He referred to the top five largest companies by way of market capitalisation and mentioned that the top five companies took 20 to 40 years to reach the trillion dollar market while other companies ranked six, nine and 10 took 130 to 230 years to get there. For the top five companies the primary asset class is data/IP algorithm. He raised the question from the audience: Where is data in your balance sheet? How are you going to understand the value of innovation? As an individual how do you measure your own success? He closed his speech with a powerful statement imploring the audience to create a model in themselves so that the country will see a better future! Nisthar Cassim, Editor of Daily FT and the moderator posed the question, what kind of a role should a management accountant play in this innovative area? Wijesundara said that there was no matrix to value an innovative company. Finance professionals needed to help achieve the vast opportunities presented by the technological progress, especially in valuing business assets and readying local business to compete globally. Wijesundara said she wanted to take her business to the status of a global leader and she would need technologically-savvy finance professionals to think beyond conventional lines in order to achieve this. Dr. Sanka Muthu-Poruthotage, Co-Founder of Linear Squared, said all of us see disruption in hindsight with only a few who can foresee it. He said ‘sharing’ becomes part of disruption. As a data scientist, he mentioned that there was a pattern between sharing and disruption. In some instances, the customers do all the hard work such as IKEA, which is also a key pattern. He cited Uber, Trip Advisor, Airbnb and IKEA as successful businesses that had rapidly emerged through major disruption using different themes to attract customers. Technology is an enabler for them. In the panel discussion answering the moderator question on how large companies should handle the disruptive environment, D’Almeida said that one needed to watch carefully but needed to respond to disruption. It is important, he said, to consider the value addition of a business, and for this reason a different set of financial statements would have to be prepared and analysed to facilitate value addition. He advised finance personnel to develop a culture of curiosity to cultivate disruptive thinking and create greater value addition. Research shows that qualities such problem solving, creativity and leadership are key to face the uncertain future. Responding to an audience question, D’Almeida said that changes were required in the education system in Sri Lanka to allow for innovations. He also further stated that creation of a sense of curiosity was vital and that the technology would find you. All panellists also provided comments on to what extent one should look for IT skills when recruiting a CFO and on the risk-averseness of Sri Lankans. Piyadigama said passion and self-belief were vital qualities in a person while Wijesundara noted that to do a disruption, “focus on simple things and unfold your idea fearlessly”. Dr. Muthu-Poruthotage encouraged hiring millennials and making them disrupt the original business set up. Thereafter, Boonsiri Somchit, Co-Founder at Xtrategize Technologies, made a presentation on ‘Psychological Impact of the Era of Digital Disruption’. Somchit in her presentation said that it is important to change with time and referred to a quote, “it is not the strongest of the species that survives nor the most intelligent that survives; it is the one that is most adoptable to change”. In her dynamic presentation she analysed the key principles required to manage change and importance of leadership in handling chaos in an organisation. Somchit laid the perfect platform for the panel discussion that followed on the psychological impact of digital disruption. Chiranthi Cooray, Chief Human Resource Officer, Hatton National Bank, said that though banks were launching digital products with considerable publicity, the consolidation and adoption of such products took much longer as only basic e-commerce infrastructure was available in Sri Lanka. Dr. Katarzyna Werner, senior lecturer of Manchester Metropolitan University, pointed out that organisational leaders needed to be role models to embrace digital disruption, that such disruption had to be shown as an opportunity and not as a risk, and that effective communication was an important management tool in doing so. Rozainne Cooray, a business psychologist and founder of Forte Consultancy, said that techno stress on employees was something that needed to be dealt through appropriate exercises in a digital environment. Somchit said it was important to be open with all stakeholders in a climate of digital disruption, recognise that not everyone would embrace such disruption at the same pace and provide employees the necessary support for change. Professor Ajantha Dharmasiri, Chairman of the Postgraduate Institute of Management, said that it was up to leaders to drive change and the people element needed to be a crucial element in such disruption. The final panel discussion was titled ‘Unlocking Opportunities – Leading the Next Generation of Success Stories’. The panellists were Carl Cruz – Chairman of Unilever Sri Lanka, Jeevan Gnanam – Chairman of SLASSCOM, Kasturi Chellaraja Wilson, FCMA, CGMA – Managing Director of Hemas Pharmaceuticals and Dumith Fernando – Director of the Colombo Stock Exchange. This session moderated by Venkkat Ramanan, FCMA CGMA, RVP Asia Pacific CIMA, discussed the important elements of leadership in Sri Lanka’s context. They spoke of the importance of effective communication with employees, the contribution of women in management, the role played by mentoring, nurturing a good culture and humility to keep learning. All of the panellists spoke of their experiences in receiving mentoring at different stages. The event also had Ahmed Irfan, Founder of Innovation Quotient, speaking on ‘Design Thinking’ and Dr. Rohantha Athukorala on ‘Unlocking Opportunities in the Sri Lankan Economy’. The final session for the day was on ‘Mindfulness for Business Leaders,’ which was presented by Lalith Pinto followed by a practical mindfulness session by Dilmi Weerasinghe. The CIMA Business Leaders’ Summit was successfully concluded with over 500 participants who actively participated in the above technical sessions.